White Cake with Cranberry Filling and Buttercream Frosting will be the hit of every holiday party with its moist, bakery style white cake (BEST white cake ever -the only white cake recipe you will ever need!) its festive sweet and tangy cranberry filling and luscious velvety Orange Buttercream Frosting. 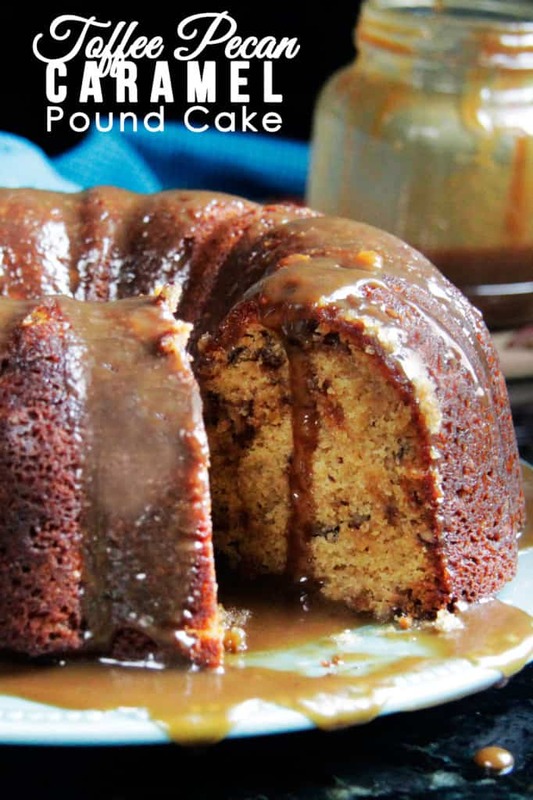 And the best part is you can make the cake and filling a day ahead for a stress free, stunningly beautiful, melt in your mouth delicious dessert! Can you believe December is just a few days away which means its time celebrate the holiday season with lights, music, decorations and fooood! Gingerbread, eggnog, peppermint, cinnamon and cranberries are what first come to mind when I think of Christmas food, or desserts, more accurately, and I have you covered this season with upcoming Gingerbread Whoopie Pies, Cranberry Eggnog Cheesecake, Nutella Cookies (with customizable add-ins) Chocolate Raspberry Cake and this rave worthy White Cake with Cranberry Filling! I had no idea this White Cake with Cranberry Filling recipe was so popular until after I had already made the cake and then googled it. 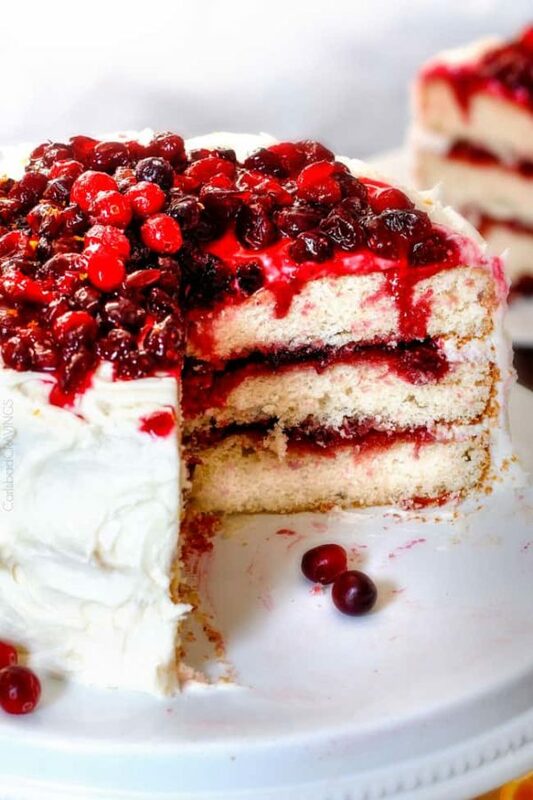 It has been done by many people, mostly the same way, but I humbly think my version is the best because any White Cake with Cranberry Filling is only as good as the white cake itself and this is the best white cake recipe EVER! I adapted Baking Illustrated’s White Cake Recipe (and we all know Baking/Cook’s Illustrated knows their stuff) to fit the 3 layers required by this recipe. The texture is perfection – so so tender, velvety with a very fine crumb and the flavor is wonderful all on its own with both almond and vanilla extract. As Patrick dove into a plain cake (practice run), he said it reminded him of angel food cake – it is that light and airy and that good you will want to eat it plain! If you have been searching for the perfect white cake recipe, this seriously is it. What sets this White Cake apart is the mixing method. After dozen of experiments, Baking Illustrated found that instead of creaming the butter and sugar as usual, if you work the butter into the flour and then whisk in milk with gently whisked egg whites, you don’t get an overglutenized cake that can be dry and riddled with small holes, but instead achieve a wonderfully velvety, soft, moist, tender cake. Thank you Baking Illustrated. 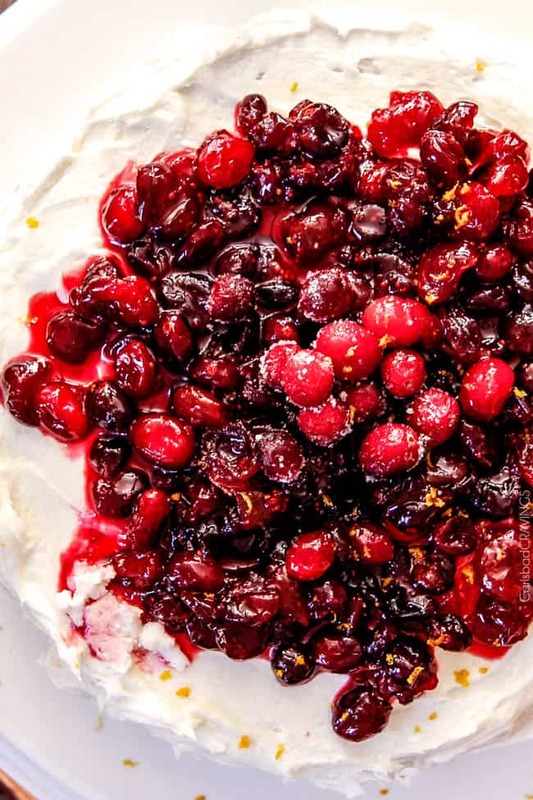 So now that we have the most glorious White Cake, it its time to make it festive with cranberries! 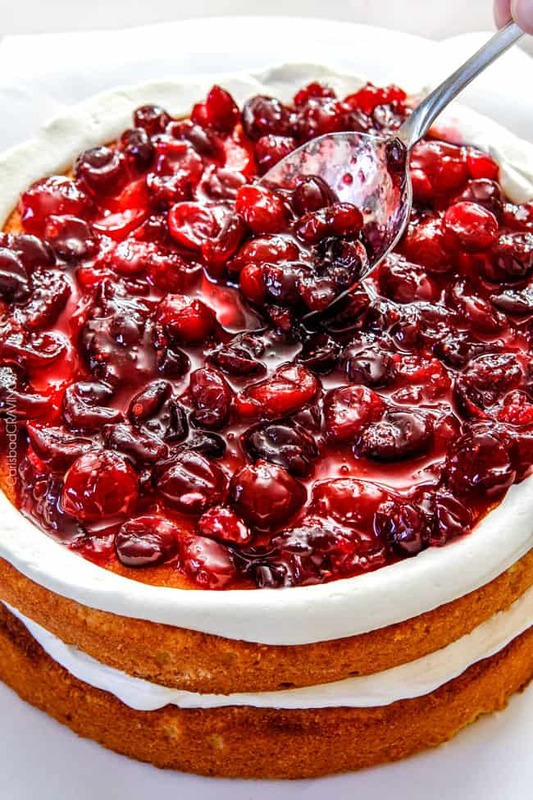 The fabulous Cranberry Filling is s simple simmering of cherry preserves (I got mine on Amazon), sugar, orange juice and fresh cranberries to create a sweet and tangy filling to perfectly compliment the sweet cake and buttercream frosting. Along with the traditional butter and sugar, the Buttercream also includes cream cheese and orange juice for an extra dreamy creamy frosting with a hint of citrus to offset the sweet. 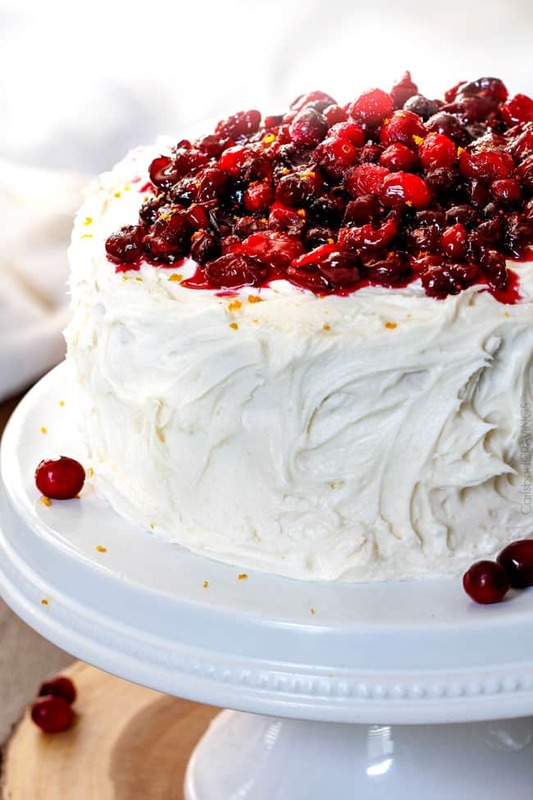 The Cranberry Filling gets sandwiched between the snowy white cake layers and then enveloped by Orange Buttercream Frosting for an impressive festive cake that will leave partakers coming back for more and more and more. Merry Christmas and Happy Holidays from my house to yours with White Cake with Cranberry Filling; stunningly beautiful decadence and melt in your mouth deliciousness! 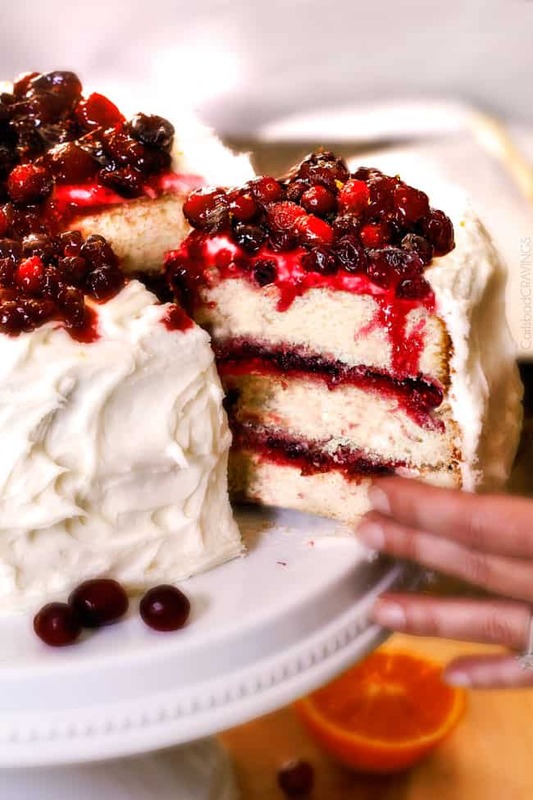 Want to try this White Cake with Cranberry Filling? Pin it to your HOLIDAY, CHRISTMAS, DESSERT or CAKE Board to SAVE for later! Add all of the Cranberry Filling ingredients to a medium saucepan and bring to a boil over medium-high heat, stirring frequently. 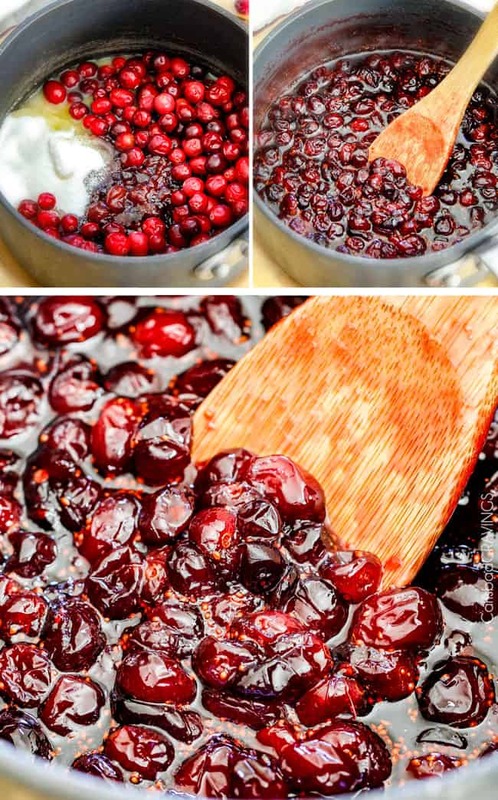 Continue to boil for 5-6 minutes, while stirring, or until cranberries pop. Transfer Cranberry Filling to a bowl and let cool completely (about one hour) then cover and refrigerate for 8 hours up to 2 days. Preheat oven to 350 degrees F. Prepare three 9-inch cake pans by spraying with nonstick cooking spray WITH FLOUR (or grease and flour pans) then covering the pan bottoms with rounds of parchment paper. Add all but 3/4 cup of milk mixture to flour mixture and beat at medium speed for 1 1/2 minutes. Add remaining milk mixture and beat for 1 minute. Beat butter, cream cheese and salt at medium speed with an electric mixer until very creamy, 1-2 minutes. Gradually add powdered sugar alternately with orange juice. Beat at low speed until blended and smooth after each addition. Beat in vanilla. To thin if needed, beat in milk, 1 teaspoon at a time to reach desired consistency. Place four strips of parchment paper around the edges of platter or cake stand to create a square with an open space in the middle (to keep cake stand clean). Place a small dollop of frosting in the center of the cake stand to keep the cake from moving and top with one leveled cake. Spoon 1 1/2 cups buttercream into pastry or plastic freezer bag. Snip 1 corner of freezer bag to make a small hole. Set aside. Spoon 1 cup frosting into a small bowl to use first to create a crumb coat ("Crumb Coat Frosting"). Top cake with a thin layer of Crumb Coat Frosting and spread evenly. Pipe a ring of frosting just inside the top edge of cake then spread 1/3 of chilled Cranberry Filling on top of thin layer of frosting, spreading to edges of piped frosting. Top with second leveled White Cake Layer. Repeat procedure with frosting/piping and 1/3 of Cranberry Filling. Top with third layer. Create a crumb coat by frosting the cake using reserved Crumb Coat Frosting starting with the top and working down until the cake is evenly frosted, removing any excess frosting. Refrigerate Cake 30 minutes or until crumb layer has set. If remaining frosting gets too soft, refrigerate as well then whip a few times before using. Frost the outside of cake as you desire with the remaining frosting. Pipe a ring of frosting around top cake layer just inside the top edge. Spread remaining Cranberry Filling (now Topping) over top cake layer, spreading to edge of piped frosting. Remove parchment paper then pipe a ring of frosting around the bottom of the cake. If not serving immediately, assembled and frosted cake should be covered with an inverted bowl or cake cover and refrigerated. It will stay fresh for up to 2 days. Bring cake to room temperature before serving. *May substitute the all purpose flour and cornstarch with 3 1/3 cups cake flour. **These ingredients MUST be at room temperature in order for the cake to be a success. ***Frozen cranberries, thawed, may be substituted. This looks SO good! Literally, the photos make it look absouloutley amazing. I need to make this. Thank you thank you Eva! And it tastes even better than it looks! Hope you can make it soon! Jen, your photos are absolutely gorgeous as always! Can’t wait to make this cake! You are too kind Aubrey, thank you so much! I am excited for you to try this cake too, I think you will love it! This looks heavenly! I am interested in trying the white cake as I already have a recipe I love but your description sounds pretty convincing. I’ll check back and let you know! Thank you Hannah! Yes, please let me know how this recpie compares to your white cake – I think you will love it – SOOO tender! I made this cake this week and it was a huge hit at work. Loved the texture. I used strawberry preserves instead of cherry since that’s what I could find at the store. I thought the almond extract was a little heavy. Next time I would use lemon extract for a citrus note against the cranberry sauce, which also turned out well. One of my favorite cakes of 2016. Hi Rachel, I am thrilled you made this cake already and that it was such a hit with all your coworkers! Thanks for the tip on the strawberry preserves – I think I will add that to the notes so people can make it more easily. Happy holidays! Oh my goodness! I make a birthday cake every month for those in the office having birthdays that month. I was talking to one of the January birthday girls and she said to make it fruity. I’d been looking at several chocolate cakes but with that request the search was on. I generally think of cranberries as a winter fruit although I love them year round and always have some in the freezer. When I found this recipe I knew it was THE cake. I make 10-inch cakes and usually have a piece or two left for the following day. But this cake, crumbs and all, gone before the end of the day. Absolute, total, success! Everyone raved and I have to say this may be my new favorite cake. It will definitely get made at least once every year. The only thing I changed was the assembly and the filling. My filling was pretty juicy so I drained off a lot of the juice. It is now cranberry syrup destined to be served with pancakes made with some orange extract and zest. I could also see in the photos that the fillling was seeping into the cake so I began with a crumb coat and then put frosting on the layers before the filling. It sat in the fridge overnight and when we served it on Tuesday it was still beautiful. This is truly one of the best cakes I have ever made and I make a lot of cakes!